It can leave a mess on your clothes, furniture, and throughout your entire home. It also can contribute to hairball problems – especially in long hair breeds – which can lead to serious health problems for your pet. Your pet’s coat is a reflection of what she eats. You’ll be surprised what a difference you’ll see if you insist on feeding your cat a premium brand food. High quality diets like Drs. Foster & Smith’s Signature Series® Healthy Cat Food Provide optimal nutrition rich in Omega-3 and Omega-6 fatty acids that help soften skin and reduce excess shedding. Vitacoat® Plus for Cats, a blend of vitamins, minerals, and Omega-3 and Omega-6 fatty acids. Mat Removing Tools remove matted and tangled hair, yet are gentle on your cat’s delicate skin. Slicker Brushes have fine wire bristles useful for final brush-out, removing mats and tangles. 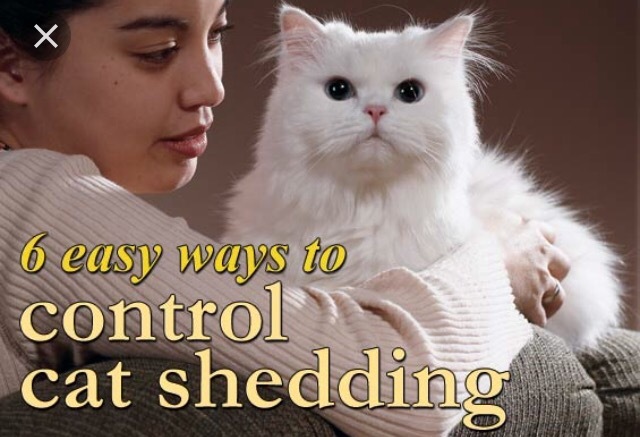 Deshedding tools remove handfuls of loose pet hair and undercoat in minutes, to promote a healthier coat. Bathing your cat regularly helps remove loose hair, excess oils, and it reduces odor. If your cat is water-fussy, you may want to use disposable pads – such as Cat Bath Wipes saturated with natural proteins and conditioners, or waterless cleaners which you spritz on, massage in, and towel off. Use attractive throws to protect your furniture. They are easy to put out during periods of peak shedding, easily removed when company visits, and can be tossed into the washer for cleaning. There is an alternative to having cat hair all over your couch or favorite chair… and your home. Cat beds, trees, or play furniture afford your cat a comfortable place of her own to hang out. The Pick-Up Roller is a proven tool and a customer favorite. Save time keeping your home pet hair free with a Mega-Cleaning Kit.